Most PC enclosures provide only a single LED to indicate hard disk access, with the LED being connected to the motherboard via a two-pin connector. However, this LED only works with IDE drives, and if a SCSI disk controller is fitted, its activity will not be visibly noticeable. This small circuit remedies that problem using a multicolour LED. The activity LED for the IDE interface is usually driven by a connected device via one or more open-collector stages. It illuminates if either of the two possible IDE drives is activated. The shared series resistor limits the current and also provides short-circuit protection. Even if the LED is shorted out due to faulty wiring, the current is restricted to a safe level. An obvious solution would be to have the IDE and SCSI disks drive a shared dual LED, but unfortunately the current flows from the positive supply line through a series resistor, the LED and a transistor to ground. The dual LED would thus have to have a common anode, but no such device exists. All known multicolor LEDs have a common cathode lead. That means they cannot be connected directly, but we’re not that easily defeated. Only a small additional circuit is needed to allow the LED to be driven by the different interfaces. 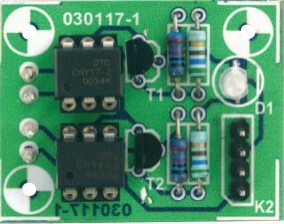 In this circuit, each of the drive signals from the two controllers is fed to an optocoupler, which acts nearly the same as the original LED. The somewhat lower voltage drop of the infrared LED results in a somewhat greater current, but there’s hardly any need to worry about overloading. The optocouplers eliminate the problems with the different voltages. On the output side, a Darlington transistor consisting of the photo-transistor and a BC547 drives the multicolour LED. The 10-k resistor (whose value of is not critical) provides secure cut-off of the driver transistor. The base of the phototransistor in the CNY17 is left open. The series resistors for the individual LED elements are dimensioned using the standard formula. It may be necessary to adjust their values slightly, depending on the relative brightness levels. The circuit can also operated from the +12-V line of the power supply if the values of the series resistors for the LEDs are suitably modified. If necessary, a third optocoupler stage can be added to allow a three-colour LED (red, green and blue) to be driven. The circuit board has been designed to be so small that the components can be fitted in a few minutes and everything can be suspended from the LED in the PC enclosure. A drop of hot-melt glue will prevent the circuit board from becoming dislodged due to vibration. The supply voltage reaches the circuit via a normal small drive connector, to make it easy to obtain the necessary plug. Otherwise, you can also use ordinary solder pins.